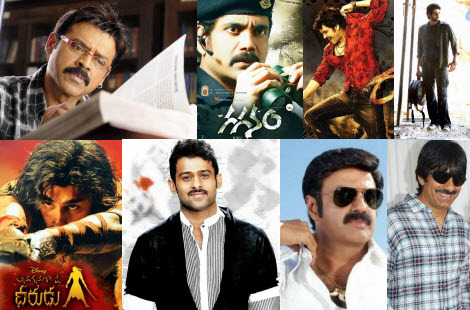 The coming 30 days would be a festive season for all of us Tollywood Fans. Eight big movies are releasing in the coming days besides the many small movies. Directed by P. Vasu, who remakes his successful Kannada film, Aptha Rakshaka, which is a slightly deviated remake of the Malayalam all-time hit movie Manichithrathazhu. The film is also a follow up to the 2005 Tamil film, Chandramukhi, also directed by Vasu, which was dubbed and released in Telugu. The movie is all set to release on 16th December 2010, after 3 days of Venkatesh's birthday. Directed by Veeru Potla. The film stars Nagarjuna Akkineni, Priyamani and Anushka. Directed by Harish Shankar. The film stars Ravi Teja, Richa Gangopadhyay, and Deeksha in the main roles. The film has music scored by Thaman. Produced by Prakash Raj and Dil Raju and directed by Radha Mohan. Also being made simultaneously with the same cast in Tamil as Payanam, the film deals with a flight hijack and stars Nagarjuna in the lead role. Principal photography of the film was completed in April 2010. Bala Krishna = Darasi Narayana Rao combo. High expextations on this. But Dasari is outdated and has proved it with his Young India. We have to wait and see what happens. Fantasy-adventure film directed by Prakash Rao, in his first mainstream film. Produced by his father, veteran director K. Raghavendra Rao at a budget of 27 crore rupees, it features music composed by duo Salim-Sulaiman, cinematography by Soundar Rajan and editing by Shravan Katikaneni. The film stars Siddharth, Shruti Haasan and Harshita as protaganists with Lakshmi Manchu making her début in a negative role. Young Rebel star Prabhas is doing a new film under the direction of Dasarath and produced by Dil Raju under Sri Venkateswara Creations banner. Kajal and Tapsee are palying the female lead roles. Directed by Puri Jagannadh starring Rana Daggubati,Ileana D'Cruz and bollywood actor,Raktha charitra fame Abhimanyu Singh are playing lead roles.Mumaith Khan is playing an important role.This is the second film for rana after Leader (2010 film) and second combination for ileana and puri jagannadh after pokiri.The film is produced bu nallamalapu srinivas(Bujji) under Bhavya creations.Music is composed by bollywood music directors Vishal-Shekhar(of Chintakayala Ravi fame) for two songs,Viswas for two songs and Bappi Lahiri.